So it's be a weird week. We got back from a road trip to LA, and then Lu ended up sick for 3+ days with fever, which meant *gulp* that she wasn't in school, and *bigger gulp* that she wanted projects to do. Both of those equal me being just a tad bit frazzled. Anyway, my points are, 1) I'm going a bit crazy and 2) neither Lu (being sick) nor I (being crazy) were really into great pictures of the projects I'm sharing with you today. So I'm sorry for the crumby pictures. Well, kind of sorry that is. Not sorry enough to actually reshoot and restage the projects! But I hope you'll like this post anyway. But enough rambling. In case you couldn't tell from the intro, this post is actually about teaching young kids about electricity. Before you think that I'm some kid of supermom that throws such things together on the off chance that my daughters just happen to be sick and need entertainment though, I must explain that I'm a leader of my daughter's Daisy Girl Scout Troop, and I actually planned these activities for a meeting that I'm in charge of. But they did come in handy this week for keeping my kids entertained!!! 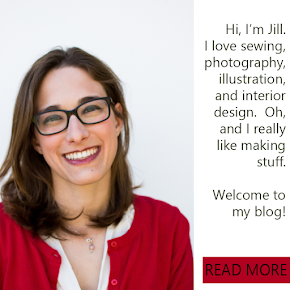 Not a single one of the activities I'm going to share with you is actually of my own design. Instead, I hope that this post will provide an example lesson plan (with project sources) that is great for an about hour meeting. I'm sharing it here because I think what I put together is hopefully useful to someone for a scout meeting, or kindergarten class, or even just a fun playdate! I'm totally all for exposing young kids to science concepts! So let's get started!! I began by asking the kids about electricity: what it is and how it's important. Then we moved on to this super fun experiment for static electricity. I talked to the kids about charges, and how opposite charges attract. 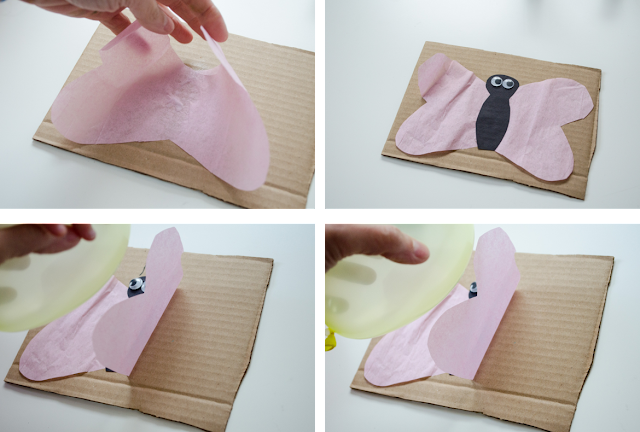 The kids really liked being able to use a balloon to raise the wings of the butterfly, and then they got to make their own. After that, we read the book Click on, Click off by Melvin Berger and discussed how charges that flow in a circle are called electricity. I didn't read them the whole book (I skipped over the science experiment mentioned in the book and instead focused on how electricity gets to our home in one big circuit). It's a great book though for explaining how electricity works. Even my 4 year old really understood how every time she turns off a light in our house she "breaks" the circuit. Next we moved on to making a human circuit. We used this energy stick toy. It's super cool because when the kids held hands in a circle the stick made noise and the lights go on. I had the kids hold hands and then hold objects between them (a stuffed animal, a fork, a piece of wood, a spoon (I asked the kids if they thought it would behave the same as the fork since it was a different shape), a hair brush). The kids hypothesized whether the item would conduct electricity. At the end we tested play dough, which led us right into our next project, playdough circuits, because Playdough conducts electricity!!! 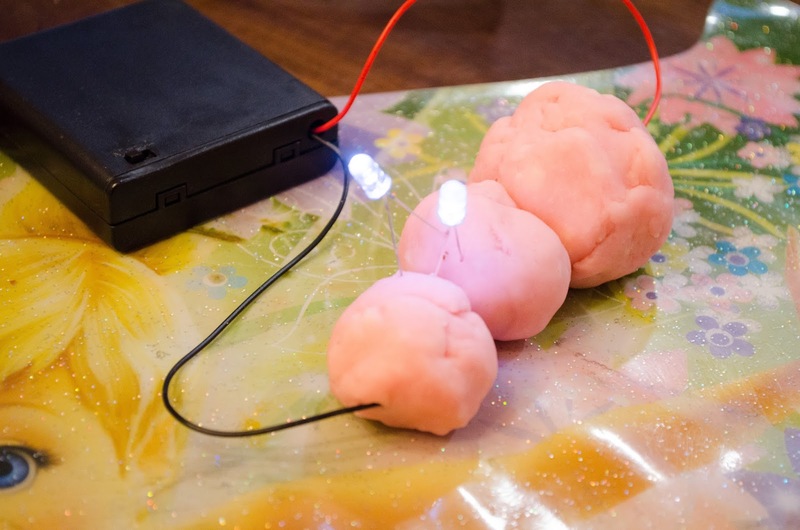 Have you seen the TED talk about play dough circuits? If not, it's totally worth watching! What a really great idea for teaching kids about how to make a circuit! 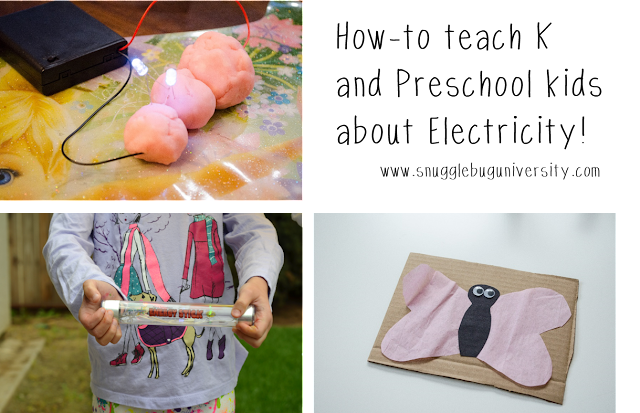 I used regular conducting dough, these safety glasses, a battery pack, and some LEDs to let the kids make caterpillars. After I showed them how to make this caterpillar, I had them ask questions, like "what happens if you add another segment to the caterpillar" or "can you add lights in different places and see what happens?" My own kids spent at least 30 minutes playing around with this, seeing what worked and what didn't. We ended the girl scout meeting by letting the kids play with Snap Circuits--which is one of my kids favorite toys. Such a fun time learning about electricity! I hope this helps someone if they need to plan a similar meeting, or just want to do a little bit of science with their kids!! This post contains affiliate links, which means that a small proportion of any sale through Amazon is given to me.